What do I do with the chrysalis? I purchased a butterfly kit for my class room with 5 painted ladies. They have each formed a chrysalis on a napkin and are inside the 1-cup container they came in. How can i move them to the butterfly house and on what should I put the napkin to which all five are attached so when they emerge, they will not damage their wings? If it is possible, could you maybe tape the napkin to the top of the butterfly house? Even taping a corner of the napkin so that the chrysalis are somewhat hanging free and there is room for the butterflies to spread their wings. Hopefully this helps. If you have any other questions, use the "Click here to add your own comment" link. P.S. 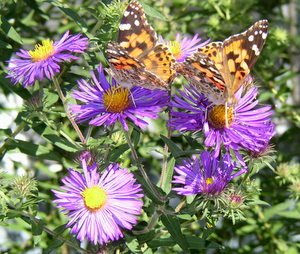 Painted Lady Butterflies love asters ...as you can see above in the photo. Join in and write your own page! It's easy to do. How? Simply click here to return to Butterfly Questions. My painted lady caterpillars all successfully transformed except for one. He has a caterpillar head still! I can't see his eyes! Is there anything I can do for him? I have released the others but I'm afraid if I let this one go he won't have a chance! I have never heard or read about this happening before. Do you mean that it never actually transformed into a chrysalis? If it hasn't and the others have gone from caterpillar to chrysalis to butterfly, then this one probably isn't going to complete it's metamorphosis. We have just had our first 3 butterflies emerge. One of them looks like this... picture is attached. Is he/she gonna be alright? I don't know how long after this painted lady butterfly emerged you took the picture, but normally it takes a little while for the wings to fully expand. Butterflies left in shipping container. I purchased 5 painted lady butterflies for my daughters new butterfly house that she got for her b-day. Unfortunately we went on vacation before they arrived. When we found the UPS box, we opened the plastic jar to find all 5 butterflies already hatched and dried. We quickly moved them to the "butterfly house", and put sugar water on crumpled paper towel. I have no idea how long they were in that tiny jar but I'm worried their wings are not, and will not fully extend. I feel horrible. Is there anything more I can do now. I don't think there is much more than trying to feed them Gaterade, Juicy Juice or sugar water. Anyone else have any other ideas or experience to share? 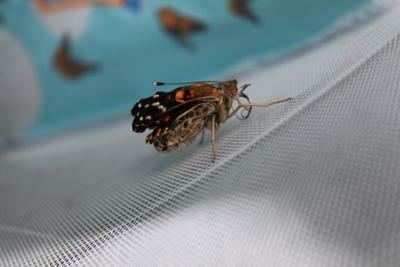 We are hatching some painted lady butterflies for the first time. The first 2 have hatched and flew away just fine. Our 3rd has been hatched for over 24 hours now and had it's wings only half inflated. Can it still be released? It seems to flutter around the habitat, but doesn't do it much unless we accidentally startle it. We've had some orange slices set out for it and it seems to be interested in them. I'm not sure if it's eating, just haven't seen it yet. I'd hate to think about it starving to death outside if it can't get to the food. It's difficult to know if the painted lady butterfly has some kind of virus or just didn't fully develop by some chance of nature. If you would like you can try and feed it with the orange slices or a 10 to 1 water/sugar solution. Boil water and stir in sugar until dissolved. It probably won't live long if you release it but also might not live long even if you try and feed it. Difficult to see...but part of what happens in nature.